BMW Motorrad has always danced to the beat of its own drum, never following fad or fashion but pursuing motorcycle design in typical German form following function. 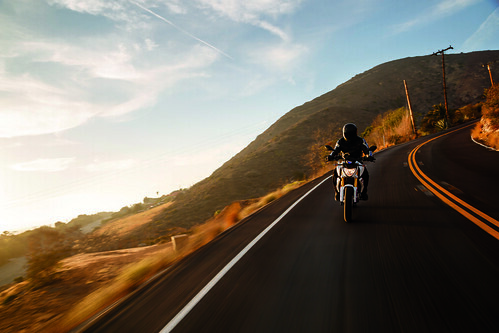 Whether it be the Luxury and Sport Touring markets, the Adventure, Sport or Roadster classes, BMW builds models proving their commitment to rider safety, technological advancement and its desire to build the world's best motorcycles. 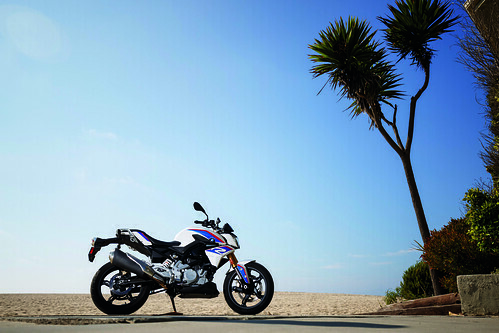 The newest model in the BMW Motorrad lineup, the G 310 R, continues that tradition and marks BMW's first roadster in the sub-500cc class. It also makes an important step toward Motorrad's ambitious goal of annual worldwide sales of 200,000 motorcycles by 2020. Developed in Munich and produced in India through a partnership with the TVS Motor Company, the G 310 R carried the burden of high expectations before the first bike rolled off the assembly line. 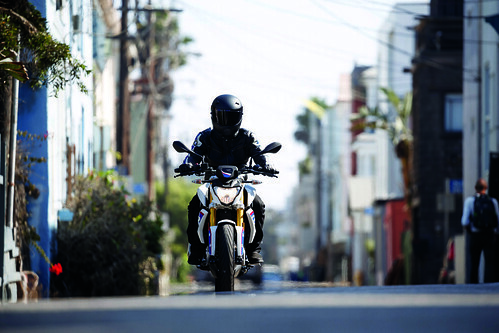 It seemed fitting, given the importance of the bike to the world market, that BMW Motorrad chose the Los Angeles neighborhood of Hollywood to introduce the bike to the world press. Just a block from Hollywood's Walk of Fame, the G 310 R was unveiled and ready to roll down the black tarmac of Hollywood Boulevard and up the twisting canyon roads that lay beyond. Upon initial inspection, the little roadster looks impressive with headlight and chiseled fairing, muscular-looking tank, gold upside-down forks and brake calipers, and lattice-like molding of the aluminum swing arm. 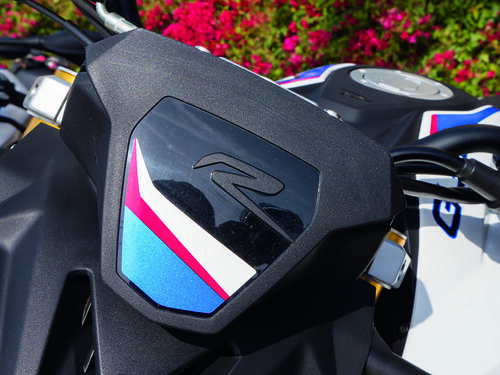 With the large "R" decals on either side of the bodywork, it doesn't take ancestry.com to see a family resemblance to the S 1000 R. Detailed touches like the high-gloss embossing and roundels on the motor, fuel tank and instrument panel are typical BMW and remove any thoughts that this bike isn't worthy to wear the roundel. 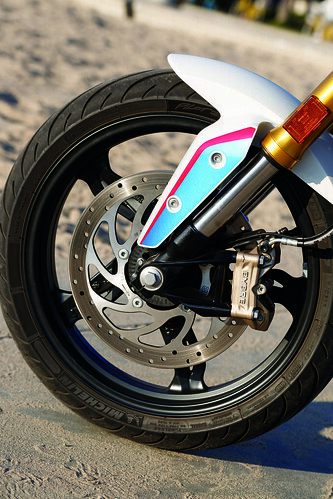 Up front, braking is controlled by a single 300mm disk using a four-piston caliper. The front fork uses a progressively wound spring allowing 5.1 inches of travel. In the back, a two-piston caliper squeezes a 240mm disk while the single shock offers 5.5 inches of travel. 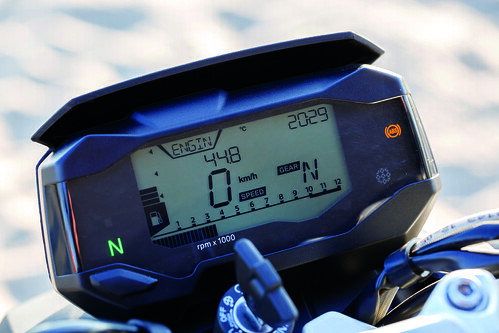 The G 310 R's instrument cluster offers a large liquid crystal display detailing MPH, RPM, odometer, engine temperature, fuel level, time/date, remaining fuel range, fuel consumption and average speed. 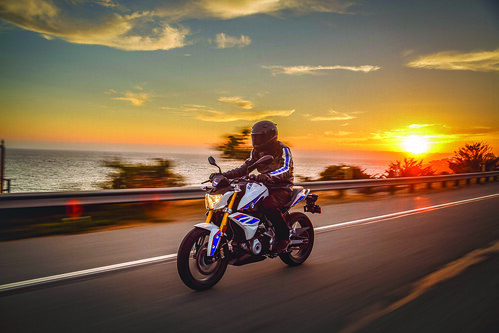 The centerpiece of the G 310 R is its newly developed, fuel-injected 313cc liquid-cooled, single-cylinder engine that produces 34 horsepower and 21 foot-pounds of torque tied to a six-speed transmission which delivers power to the rear wheel via chain drive. 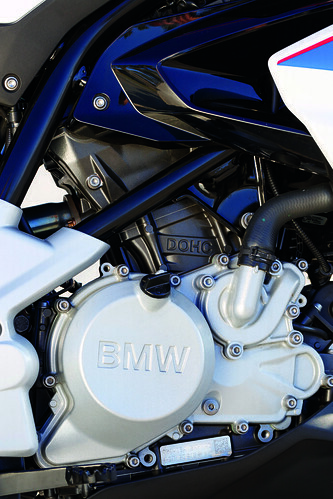 The unique feature of the four-valve DOHC motor is its reverse cylinder design using a backward-tilted cylinder and head rotated 180 degrees, positioning the intake in the front and the exhaust in the rear. The design allowed engineers to create a straighter airflow through the engine to maximize performance. 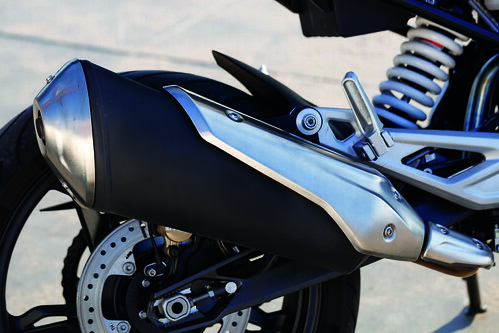 According to BMW, the backward-angled cylinder also helps keep the bike's center of gravity lower and shifted forward to allow for a longer swing arm in the 310's relatively short wheelbase. 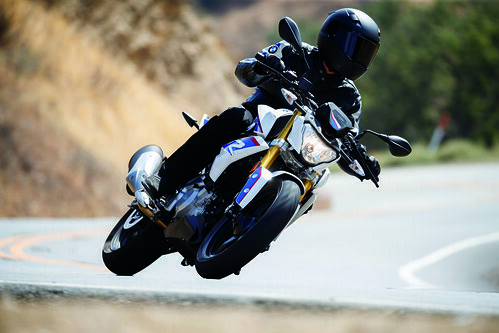 Like all BMWs, the G310 R comes equipped with ABS as standard equipment. Seeing 45 identical motorcycles lined up in perfect German precision along Selma Avenue was a beautiful thing. 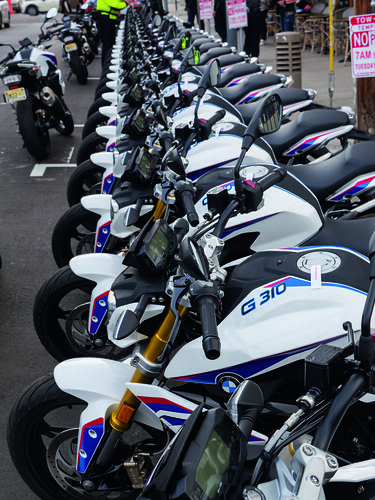 As we mounted the bikes, another journalist likened the long line of 310s all dressed in white with Motorsport color highlights to piano keys. I had to agree and with a turn of a key and the push of the starter button, they all came to life, not with a familiar boxer motor's shake and rumble or the turbine-like rev of the S 1000 power plant, but with a rhythmic staccato of microwave popcorn. Intimidation factor: zero. As we pulled away, I found the relationship between the handlebars, seat and foot pegs relaxed, and at the first red light, both boots rested comfortably on pavement. As we wound our way through the morning rush-hour traffic, the comfortable ergonomics were welcome, and the 310s spirited motor was always willing to please, provided the correct gear was chosen. Once on the 101, the 310 R weaved easily through the surrounding traffic, with the motor humming along at 7,500 RPM while pushing the bike along at a comfortable 75 miles per hour. Just as I was beginning to think I was riding back home down a straight and boring central Illinois highway, we exited onto Topanga Canyon Boulevard and then headed west on Mulholland Drive. Jay Leno has compared Mulholland Drive to the Nürburgring, the race track in Nürburg, Germany. Known to most as "The Ring," it's widely considered to be the toughest, most dangerous and most demanding race track in the world. Mulholland Drive is 55 miles long, with eight overlook points, and is the most well-known of Los Angeles' scenic drives. Signs along many of the tight curves warn riders of the consequences of being seduced by the breathtaking views of the Los Angeles basin and San Fernando Valley below. Other signs warned of horseback riders and mountain bikers. It took only moments to realize I wasn't riding in Illinois anymore. 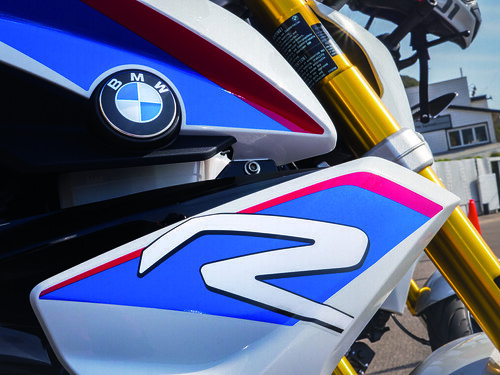 Unlike the other bikes in the BMW family, the G 310 R requires an active left foot to keep the motor happy. Forget about relying on a bunch of cc's and a couple gears to get you from corner to corner. The G 310 R just doesn't have the horsepower, but it will keep up with its bigger siblings as long as it's in the right gear. What the G 310 R lacks in simple horsepower, it makes up for in spades with it's easy handling and agility. The short wheelbase and light weight allow for quick and predictable cornering which combined to make the bike a blast to ride through the canyons. No ride on Mulholland Drive is complete without stopping at The Rock Store. Originally built as a hot springs resort, legend has it that during the days of prohibition the owner was a bootlegger, with the resort attracting Hollywood heavyweights of the day with hot water baths and whiskey. Later, it was a gas station and a grocery store before becoming a hot destination in the 1960s when Steve McQueen began blasting through Mulholland on his Triumph. The road's popularity grew over the years, and even an aggressive crackdown on speeding and a temporary closing in the 1990s did little to slow the "The Snake's" popularity. Back on the 310, we continued onward, eventually intersecting State Route 1, the Pacific Coast Highway. With the day growing longer, it was time to head back. 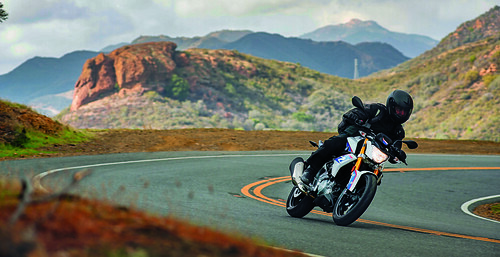 BMW route masters spend a great deal of time creating routes to illustrate a new model's capabilities, and with the canyon-carving ability of BMW's newest roadster now proven, we were shown how the G 310 R handles commuting duties. Our ride on the PCH took us through Malibu and along Sunset Boulevard past UCLA, the Hollywood Bowl and other area landmarks before turning onto the circus that is Hollywood Boulevard. 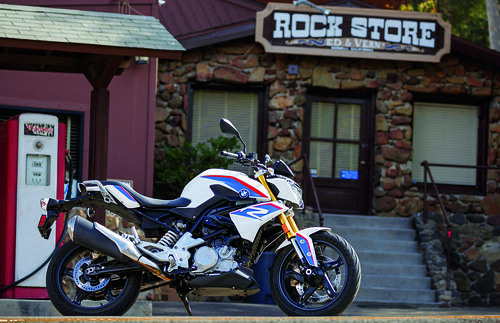 In my brief time getting acquainted with the G 310 R, I'm convinced BMW Motorrad hit all the right chords, and with the new bike's sub-$5,000 sticker price, dealers will have a difficult time meeting early demand. Most of us began riding small displacement bikes and were eventually seduced by multiple cylinder models with lots of displacement. The G 310 R has proven to me that bigger is not always better and a rider can have a lot of fun on a small bike.